Gulf Construction Online - Countdown begins! 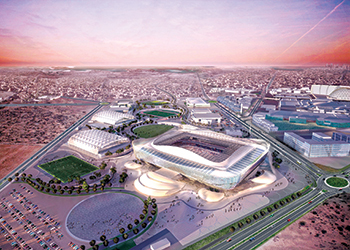 An artist’s impression of Khalifa International Stadium. As the countdown begins for Qatar to host the world’s most prestigious sporting event, the nation’s Supreme Committee for Delivery & Legacy (SC) is gearing up to mark the first milestone – the completion of the first of the eight stadiums that will host the 2022 Fifa World Cup. First at the finishing line will be the Khalifa International Stadium, a venue replete with history that is being transformed in line with Fifa’s requirements. The refurbished stadium is expected to be completed in the last quarter of this year. Five other venues are also under construction and these include Al Wakrah Stadium, Al Bayt Stadium – Al Khor City, Al Rayyan Stadium, Qatar Foundation (QF) Stadium and Lusail Stadium. Designs have also been unveiled for the seventh and eighth proposed host venues for the World Cup, which are destined to take shape in Ras Abu Aboud and Al Thumama – though their precise location is yet to be finalised. 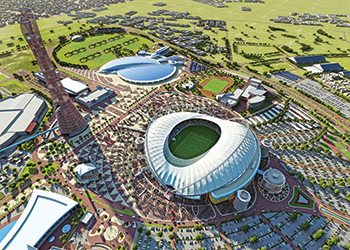 The SC and its stakeholders have been tasked with delivering stadia and other infrastructure for the major sporting event, with its ambit stipulating timely delivery of infrastructure and competition and non-competition venues; integrating Qatari culture into all hosting plans; and adopting high environmental standards on all projects, contributing to the delivery of a carbon neutral tournament. Among the last two of the stadium designs to be unveiled by the SC, the Ras Abu Aboud venue will enjoy an exceptional waterfront location visible from West Bay. This stadium is expected to pioneer the ‘design-for-legacy’ concept as one of the world’s first stadiums to be designed from the outset with the flexibility to be transformed into a successful and dynamic mixed-use urban neighbourhood after the tournament. Global architecture firm Populous is the design consultant for the venue and TiME Qatar, the project manager. The 40,000-seat venue will host matches up to the quarter finals. The 450,000-sq-m site, located near Hamad International Airport, will include 6,000 car-parking spaces during the tournament and 2,000 in legacy mode. For the eighth proposed host venue in Doha’s Al Thumama neighbourhood, the SC has appointed Arab Engineering Bureau (AEB), the oldest architectural and engineering consulting firm in Qatar, as design consultant. The stadium will have at least 40,000 seats and will host matches for the quarter-finals stage. In legacy mode, its capacity will be reduced to a maximum of 20,000 seats. The stadium will be located on a 515,400-sq-m area that already comprises four outdoor training pitches and office facilities currently used by the Qatar Football Association Technical Committee. 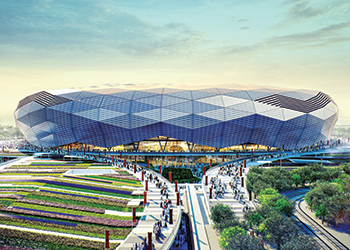 Among the stadiums that are under construction, Khalifa International Stadium at Aspire Zone, located 5 km west of Doha, will be the first proposed host venue to be completed in late 2016. Extensive refurbishment work on the project is being carried out by a joint venture of Midmac Contracting and Sixconstruct Qatar (a subsidiary of the Belgian Besix Group). Dar Al Handasah and Projacs are the design and project management consultants respectively. Over 3,200 people work daily at the site of the historic stadium. Khalifa International Stadium is the proposed host venue for group stage, round of 16 and quarter-final matches. Currently, state-of-the-art LED (light emitting diode) pitch lighting supplied by Dutch lighting expert Philips is being installed at the stadium. Installation work will be finished towards the end of the year, once the roof installation system has been completed. “This is considered as the first World Cup stadium to be equipped with LED lighting, which is the future of lighting,” says George Brax of Philips. The floodlights are digital, allowing the same system to be used for entertainment and general lighting. Originally built as a 20,000-seater stadium in 1976, the stadium is currently undergoing a comprehensive renovation to meet the Fifa requirements and standards for World Cup stadiums. Work includes adding a new building to the east wing, and building a single roof to cover the whole seating area. Among the new additions, the stadium will include the 3-2-1 Qatar Olympic and Sports Museum, which will include historic sport collections and interactive exhibits. Food courts, shops, multi-purpose rooms, VIP lounges and a health centre will also be available on the upper and lower concourses in the east wing. After the renovation, Khalifa International Stadium will seat more than 40,000 spectators and will be completely cooled, including the field of play, all seats and concourses. Located 20 km west of Doha, Al Rayyan stadium is being built on the site of Al Rayyan Sports Club’s former stadium (Ahmed Bin Ali Stadium), which was demolished to make way for the new venue. Currently at the tendering stage for the main contract, the project is expected to be completed in the first quarter of 2019. The stadium will have a capacity of 40,000 spectators and host group stage, round-of-16 and quarter finals matches. In legacy mode, its capacity will be reduced to 21,000, with the upper tier of seats being removed and sent to developing nations in need of sports infrastructure. The stadium will also feature innovative and sustainable cooling technology, which will ensure comfortable viewing conditions for fans and an optimal playing temperature for players during the legacy use of the stadium for domestic competitions, international matches and tournaments hosted in Qatar throughout the year. 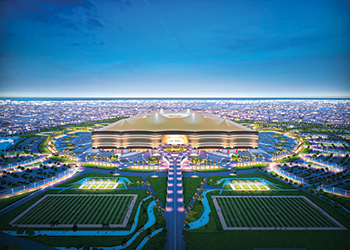 Commenting on its design, which was unveiled last April, Hassan Al Thawadi, secretary general of the SC, says the stadium’s design reflects Al Rayyan’s sporting heritage and Qatar’s environment. The stadium’s façade will feature a multitude of local patterns and designs, which draw on Qatari culture. Featuring an innovative exterior design, it also aims to create a sense of place unique to Al Rayyan in particular, and more generally to the culture of Qatar. Most of the hospitality and service areas will be located outside the stadium in dune-like structures. Sustainability is at the heart of the design, beginning with the deconstruction of the old stadium, with 90 per cent of the materials resulting from the demolition being reused. The state-of-the-art design will actively reduce the carbon footprint of the stadium and precinct through on-site renewable energy, lightweight building design, careful selection of materials, and both energy and water efficiency measures. The stadium is designed with the goal of certification under both the Global Sustainability Assessment System (GSAS) and Leadership in Energy and Environmental Design (Leed) ratings. 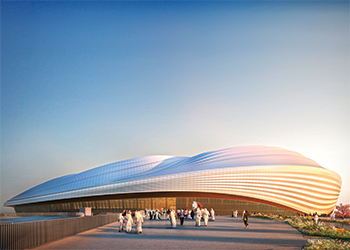 The stadium and surrounding precinct will contain a number of facilities and features that will be used by the local population of Al Rayyan, including a mosque, members club, athletics track, cricket pitch, tennis courts, hockey pitch, football training pitches, aquatics centre, skate park and cycling track. The precinct will also house a new branch of Aspetar – the leading sports medicine hospital. 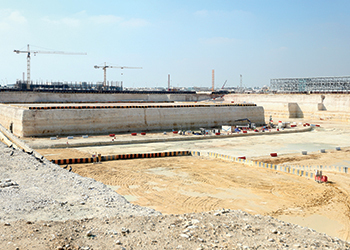 Enabling works procurement has begun for the Lusail Stadium, the largest proposed venue of the 2022 Fifa World Cup and site of the opening ceremony and the final match. London-based world-renowned architects Foster + Partners is carrying out the architectural design work as part of a team of sports and stadium design experts which includes Arup and Populous. The Lusail venue, spread over a 1-million-sq-m precinct, is expected to an iconic, contemporary stadium inspired by Qatari culture. “Lusail Stadium will be the centrepiece of the tournament, an architecturally innovative stadium which maintains sporting functionality and delivers on our sustainability commitments,” says Al Thawadi. The final design for Lusail Stadium will be presented this year. Located in Lusail City, 15 km north of Doha, the stadium will have a seating capacity of 80,000 spectators and will contain an open-air pitch that can be cooled to an optimal 26 deg C using cooled and shaded spectator stands and state-of-the-art green technologies. Following the completion of enabling works, vertical construction work is now due to begin soon on Al Wakrah Stadium following the award of the main contract to a joint venture of Midmac and Porr Qatar last December. The stadium is expected to be completed in 2018. The SC commissioned Aecom and Zaha Hadid Architects to undertake the design of the project back in 2013. Since Al Wakrah is renowned for its heritage as a fishing town, the inspiration for the design of the stadium – which will be the future home of the Al Wakrah Sports Club – was linked to the dhow. The design team also wanted to reflect the culture and traditions of Al Wakrah in the materials used in the stadium. To do this, they came up with an idea of using timber. To ensure that it could withstand the specific conditions of Qatar, the team opted to create a robust and durable shell and a building with shades and natural cooling. The venue, which will host quarter-final matches, will have a capacity for 40,000, reduced to 20,000 in legacy mode. Al Wakrah Stadium will be surrounded by approximately 560,000 sq m of legacy precinct, including a new sports centre and community hub. The precinct will feature a range of community facilities, such as a park, mosque, school, hotel, wedding hall, vocational training centre and retail outlets. Works are also under way at the precinct to build the primary substation for the stadium to ensure power supply prior to completion of main construction works at the site. During the enabling works phase, approximately 460,000 cu m of earth was excavated, 25,000 cu m of concrete poured for the foundations and more than 2,800 m of pipes installed. A joint venture between Galfar Al Misnad and Salini Impregilo Group is working on the main contract for the construction, operation and maintenance of Al Bayt Stadium. Located in the town of Al Khor, 35 km north of Doha, the stadium design draws on the Bayt Al Sha’ar Bedouin tent for inspiration, reflecting Qatar’s proud history and culture and welcoming visitors from all over the world to the culture of the desert. With a proposed capacity of 60,000, the stadium meets Fifa requirements to host group, quarter-final and semi-final matches during the World Cup. The design includes an upper tier of removable seats, which will reduce its capacity to 32,000. Completion due in 2018, well ahead of the competition. Dar Al Handasah is the design consultant on the project, and Projacs, the project manager. Enabling works have been completed and vertical construction will begin imminently on the Qatar Foundation Stadium, which will fulfil all Fifa requirements for hosting matches through to the quarter-finals. The new 40,000-capacity stadium will be located in Education City, the home of Qatar Foundation for Education, Science and Community Development (QF). Following the 2022 Fifa World Cup Qatar, the stadium’s capacity will be reduced to 25,000 seats. The stadium has been designed to host sports events and activities throughout the year, incorporating world-class facilities such as an Olympic-size swimming pool, diving facilities, multi-purpose pavilions for all types of indoor sports and concerts, plus open-air football training grounds, indoor and outdoor tennis pavilions and basketball courts. It is slated for completion in 2018. It is being delivered by QF, a SC stakeholder. RFA Fenwick Iribarren Architects of Spain is the lead design consultant. The enabling works contractors are United Construction Engineering (UCE) and Consolidated Contracting Company (CCC)/Teyseer, while the project and construction management team comprises Astad and Louis Berger. Qatar Foundation Stadium ... enabling works completed. The stadium’s design draws on the rich history of Islamic architecture and celebrates light by reflecting the intensity of the sun. The façade is characterised by triangles that form complex geometrical patterns, which appear to change colour as the sun arches across the sky. Photovoltaic and reflective technologies embedded into the stadium’s roof will produce renewable energy that will be used for electricity and hot water generation. These innovative renewable energy sources will also help to power the stadium, aquatics centre and indoor multi-purpose pavilion. At least 20 per cent of the materials used for the project will come from sustainable sources. Furthermore, 50 per cent of all wood-based materials will be procured from sources with sustainable forest management practices, and 20 per cent of all materials will be sourced regionally. The venue will also have a health and wellness precinct, which will include an aerobics and fitness centre, aquatics centre, climbing and caving centre, tennis courts and two additional football pitches. Spaces for educational and development programmes, a health clinic, an indoor multipurpose pavilion and retail outlets will also be available in the precinct. Aiming to make the 2022 Fifa World Cup a fully inclusive tournament, the SC has planned for all stadiums to have detailed access plans for disabled people built into their designs. The SC is developing environment-friendly cooling technology which will allow football to be played in the country year-round after the event. It is considering nine cooling methods as part of an integrated approach in the design of different facilities and venues from concept design phase. These include solar shading, natural ventilation, district cooling systems, night-time ventilation, evaporative cooling, mechanical ventilation, hybrid ventilation, refrigeration, and air-conditioning.